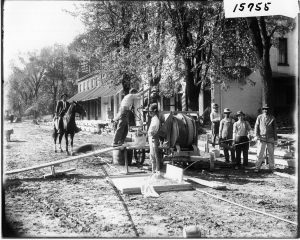 Construction Workers with Cement Mixer on High Street, Oxford, OH, 1916. Most of America transformed greatly during the Gilded Age due to significant technological innovations of the time, and the city of Oxford was no exception. An Ohioan community even more rural and remote then than it is today, Oxford existed in the 19th century as a small town inhabited mostly by craftsmen, lumberjacks, and agriculturalists. The way Oxford residents lived was completely revolutionized by the turn of the century thanks to the construction of the railroad and several industrial mills as well as the introduction of electric light. Although the benefits of this innovative period of time are now apparent, these benefits were sometimes not always clear to people living at the time. Progress was desired by those who could see its long-term advantages, but reviled by others who felt it impeded upon their daily lives. However, as time went on, more people began to envision the lasting opportunity and increased quality of life new technologies would allow them. Citizens’ attitudes about progress and development changed just as much as Oxford itself changed during the Gilded Age. In 1817, Miami University donated a plot of land to Oxford Village that would come to be known as Outlot #2. This land was designated as a public cemetery but was destined to become so much more. By 1853, Junction Railroad Company proposed to construct a railroad in Oxford, but the plan entailed laying track right through the Old Yard. Although they were not fond of the idea, the Oxford Village Council agreed to allow the railroad be routed through the cemetery under certain conditions outlined in a contract. Unfortunately, the ambiguity of said conditions led to decades of problems for Oxford residents. This stipulation appears to have required the Junction Railroad Company to assume the responsibility of arranging the removal of the deceased from the lot. However, upon closer examination, the statement does not clarify the definition of “satisfactory arrangements.” This led the railroad company to demand that relatives of the deceased remove the bodies by any means necessary without offering guidance or instruction on how they should go about doing so. Aside from demanding that the bodies be moved from the portion of the lot through which the track would run, the railroad company had no further involvement in actually planning the removals. This left many Oxford residents looking for answers as to whom should take financial responsibility for the removals and where workers willing to perform the removals could be found due to the questionable ethicality of disturbing the dead. Additionally, the aforementioned stipulation only required removal of the bodies from the part of Outlot #2 affected by the construction of the railroad. This raised questions regarding whether all of the bodies in Outlot #2 should be removed and whether the site should continue to be used as a cemetery. These questions would not receive any definitive answers for another 35 years, resulting in decades of unfriendly town meetings and blunt newspaper editorials. Lack of cooperation from town officials, disputes over money and responsibility, and ethical controversies contributed to financial difficulties, emotional distress, and general frustration among Oxford residents. These issues were largely due to the lack of another public cemetery. Residents who could not afford to purchase expensive private cemetery plots had no choice but to reluctantly inter their loved ones in the Old Yard, which had fallen into extreme disrepair upon the completion of the railroad. Meanwhile, residents with no connection to the Old Yard became disgruntled over its mere existence because it was such an eyesore. To remedy this situation, the Oxford Village Council called a meeting with the Oxford Township Trustees in 1877, imploring them to condemn the Old Yard and establish a new public cemetery. A transcription from this meeting reads, “The Township Trustees were not disposed to do anything about vacating the old graveyard.” Therefore, it is likely that the Township Trustees felt that the Oxford Village Council was solely responsible for any problems that arose as a result of the railroad agreement, and the Township Trustees did not want to be held legally or financially responsible for a problem in which they were not initially involved. Additionally, it would have been difficult to vacate the cemetery at this time due to the unwillingness of public committees to provide funds to assist families who could not afford to have relatives exhumed and were also unwilling to pay for the removal of the deceased who had no surviving relatives. This quote points out another serious issue, being that some Oxford residents believed disturbing the eternal rest of the dead was morally wrong and so objected to removing the bodies of their loved ones based on beliefs alone. The emotional and financial strain felt by the families and friends of the deceased interred in Outlot #2 was a direct result of the deal made with the Junction Railroad Company. The failure of the Oxford Village Council, the Township Trustees, and the Miami Board of Trustees to take any responsibility for the continued grief and frustration experienced by the citizens of Oxford contributed to some public opposition of pursuing more public works projects reflective of progress in the future. Oxford residents likely felt a particular interest in the project for a variety of reasons. Being a rural farming community, Oxford agriculturalists relied heavily on their crop yield for income. After harvest, they would then have to find a merchant willing to purchase from them at a fair price. The flour mill provided agriculturalists who produced wheat and corn an opportunity to sell their crop directly to the owner of the mill, Mr. Keller. This alleviated some stress from farmers scrambling to find a buyer at the end of the season. Oxford residents likely also realized how lucrative the mill would be for the town as a whole. Although it was a large investment funded partly by the town, the investment was certainly worth the return in the years to come. An article by The Oxford News stated, “The capacity of the mill will be 75 barrels per day.” Another article stated, “On the first floor…is a receiving elevator with a capacity for elevating 250 bushels each hour. In the basement is all the shafting connected with the engine; also corn bolters and shellers with a capacity of 1,000 bushels per day.” The yield of flour the mill could produce was quite impressive and would require a massive amount of crop to do so. The flour produced at the mill was sold locally and also allowed Oxford to participate in trade more than ever before. The large output of product the flour mill produced also created new job opportunities for residents. Oxford citizens now had the opportunity to be employed in an industrial setting. In fact, the mill was so successful, Mr. Keller looked into expanding the work force almost immediately after the mill was finished. An article stated, “The services of six men is required to run the mill. At present, it will only be run during the daytime, but should trade demand, a night force will be secured.” Anticipating this, Mr. Keller had the mill equipped with capabilities for electric light, which would lead to Oxford’s next big project the following year. The industrialization of agriculture via the flour mill allowed Oxford more opportunities than one could have conceived, including increased revenue, expansion of trade, new job opportunities, and the town’s introduction to electric light. In 1889, the Oxford Electric Light Station was constructed on Outlot #2, just to the south of the flour mill. Although the purpose for its construction was to power electricity at the flour mill, the electric light plant brought with it the potential to one day power the whole town. Even before its rise to popularity, Mr. Keller realized the value and importance of electricity. The Oxford News wrote, “The entire building and engine room will be lighted by electric light. Mr. Keller regards this light as the only safe one to use in a mill, and has signified his intention of having that invention at any cost.” Mr. Keller’s high regard for electricity is significant because, at this point in time, electricity had not even made its major debut at the Chicago World’s Fair. It would have been the highest luxury to own an establishment powered by electric light. In a report of progress, The Oxford News wrote, “What have we accomplished? …not the least of all we have eradicated the old graveyard and made room for a first-class steam roller flouring mill. …And now the people demand electric light, and they will have it.” Overall, Oxford residents were quite impressed with the improvements the town made and quickly forgot the strife they endured when dealing with the construction of the railroad. After the construction of the Oxford Electric Light Station, Oxford residents were so enthused with the progress the town was making, it was decided that even more establishments would open on Outlot #2 by 1908, including a saw mill and an ice plant. By the end of the Gilded Age, one plot of land managed to catapult Oxford into the future and its residents never looked back. Outlot #2 began as something as simple as a public cemetery. By the end of the Gilded Age, it had transformed into the modern epicenter of town. Those living in Oxford during the later half of the 19th century witnessed the town transform before their eyes, whether they willed it or not. Although residents faced decades of frustration, confusion, and tribulation as a result of change, they continued to gamble on progress in hope of a better future. It is much easier to appreciate progress upon reflection than it is to live through the turbulent times in which progress is being made. Oxford residents persevered through uncertainty and stress in the name of change to create a better life for themselves and for future generations to come. Sylvia Ferguson, Burial Grounds of Oxford, Ohio 1817-1987 (Oxford: The Smith Libra ry of Regional History, 1989), 2. Junction Railroad Company Contract, October 4, 1853, in Ferguson, 143. Law Committee Report, June 1887, in Ferguson, 27. The Oxford News, April 1887, in Ferguson, 27-34. Oxford Village Council proposed to give the donated land back to Miami University if the Miami Board of Trustees would agree to pay for the removals. The Oxford News, April 9, 1887, in Ferguson, 33. The Oxford News, April 9, 1887, in Ferguson, 33. The Oxford News, April 9, 1887, in Ferguson, 34. Miami University Board of Trustees agreed to pay for half of the expense of removing the bodies not exceeding 150 dollars. Oxford Village Council would pay the remaining expense. Removal totaled roughly 305 dollars. Council Minutes, July 16, 1888, found in Ferguson, 42. The Oxford News, May 19, 1888, in Ferguson, 40. The Oxford News, May 7, 1887, in Ferguson 35. “Progress,” The Oxford News, September 15, 1888, in Ferguson, 43. “Progress,” The Oxford News, September 15, 1888, in Ferguson, 44. “1892 Sanborn Fire Insurance Map,” in Ferguson, 45.